2 or more 30% $10.47 per pc. Hand Drawn Lines Tablecloth from 67266 tablecloths will be an excellent choice to add a unique design to your home decoration. Its true colored and 3D printed design will be an elegant and final touch into the service in your dining room. You can dress up your dining tables with 67266 table covers in any sizes from 52x70 to 60x90. 67266 themed and square table linens will create a style in every design. You will enhance your home decor with your favorite tablecloths that are available for sale on Ambesonne.com and it will cost only $34.90. Shop now in our online store with free shipping! Professionally printed unique designs prevent their colors from fading, so there is no need for you to buy shower curtain liners. It includes effective and strong shower curtain hooks, which are easy to hang and use. It includes free shower curtain rings that help you to hang it simply and enjoy your fresh decor. Exclusive designs and useful auxiliary products create a marvelous shower curtain set just for your taste. Our products are lightweight and thin, so the lifting capacity of shower curtain tension rods is not an issue any more. Straight ones are always better than the curved shower curtain rods toshow your place wide and modern with the wonderful patterns from Ambesonne. 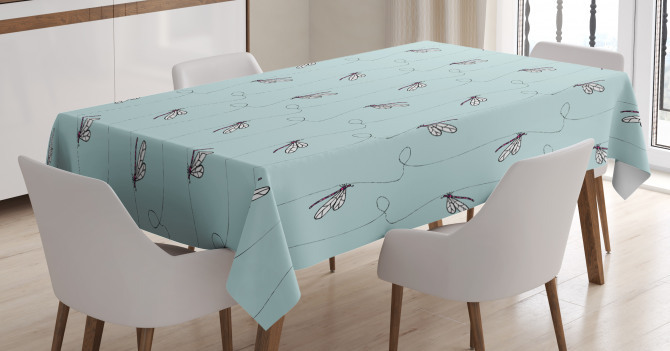 Go ahead and buy this tablecloth and you will not be sorry. The fabric is quality and it looks great. It is really easy to take care of washes great and dries quickly. Finish on the seams are really nice too. I really recommend this product. The colours are nice too and it did not fade yet. I love this!!! It is wonderful and goes with every season. I have a glass dining table and it looks wonderful on it. I have bought a second different design so when I want to change things up a bit I can just put the other one. This is really artistic and cool. This is not your typical oil cloth! It has vibrant green tones with quality print. I like it so much that I bought another cover on it so my grandchildren would not ruin the beautiful design. It fits with my home garden décor. My vegan daughter loves it. I have received many compliments from various friends. I have washed it 3 or 4 times and the colors have showed no signs of fading so that is always a plus. This is a curious company. They make some classy tablecloths. The design and colours are perfect. My only complaint is they do not make square shaped tablecloths. Everything here is rectangular. I have a smaller kitchen and would like to get a square one but no luck for me I'm afraid. I bought this for my daughter-in-law and she loved it. Oh my goodness the design is perfect and fit just right. As if they made this for their table. Thickness is nice and wipes clean really easy. Though it is not flannel the design is perfect and colours are just right.